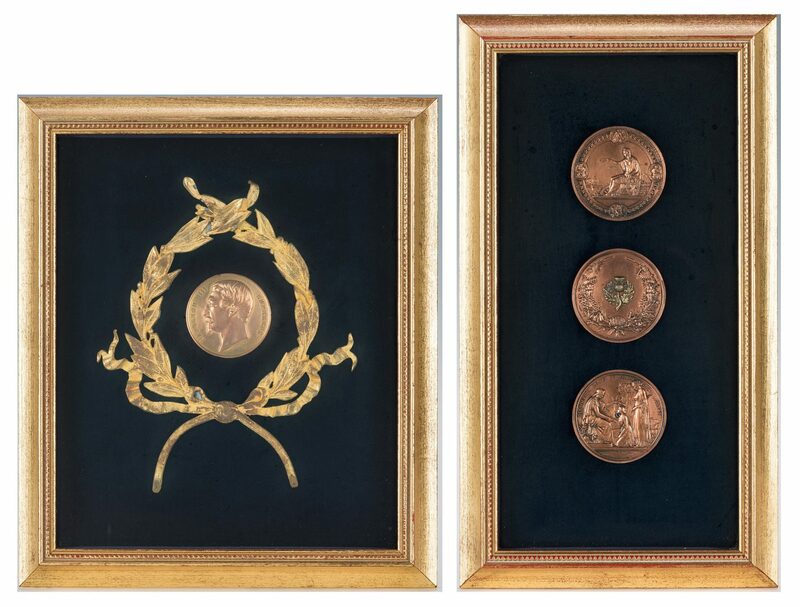 Four (4) Medallions in two (2) frames, including Wyon 1851 Exhibition. 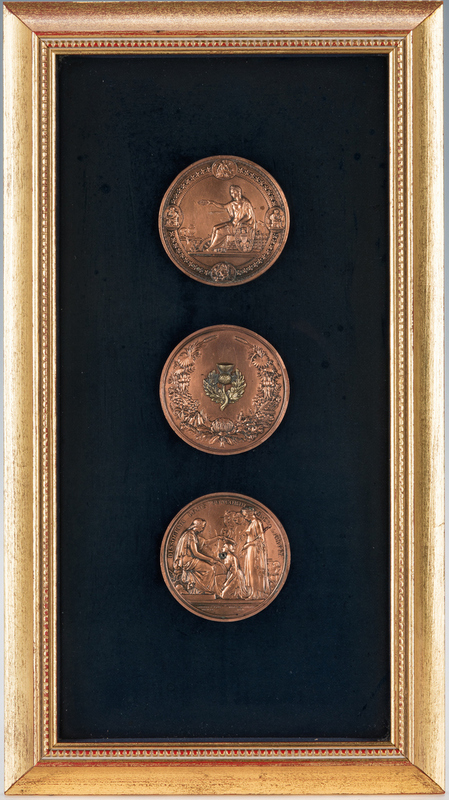 1st item: Group of three (3) Britannia themed bronze medals, including one (1) 1851 Exhibition of All Nations Prize medal by W. Wyon and L. C. Wyon, Framed showing reverse side with Britannia seated and bending forward, raising with one hand and crowning with the other, the kneeling figure of Industry, presented to Britannia by Europe, Asia, Africa and America. Inscription around the border: DISSOCIATA LOCIS CONSORDI PACE LIGAVIT ("It has bound together in peace and friendship things widely separated"). 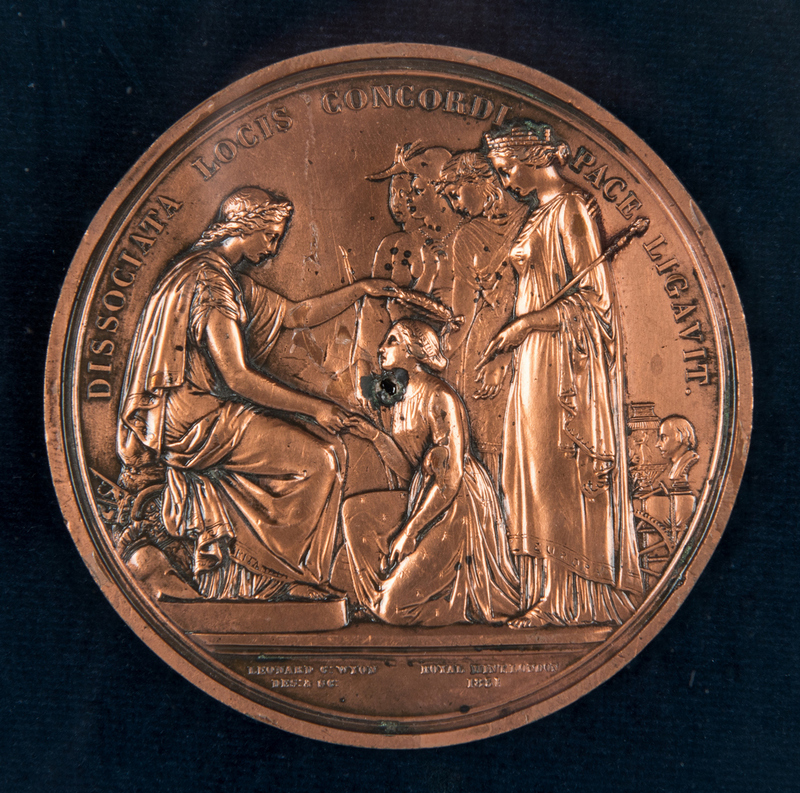 PRIZE MEDAL OF THE EXHIBITION printed on edge. 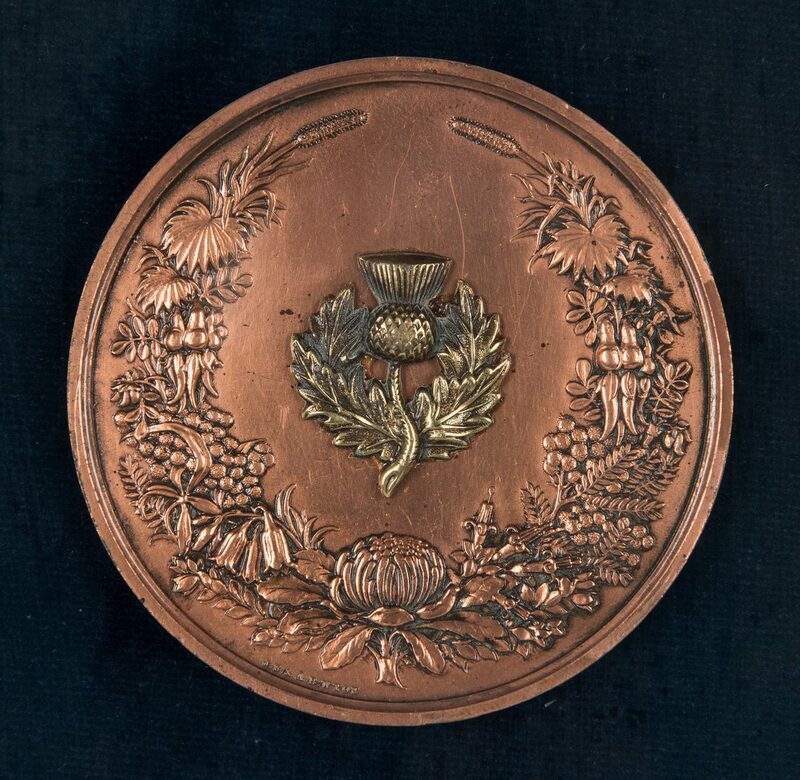 Hole in center to fix; one (1) medal with central thistle in high relief. 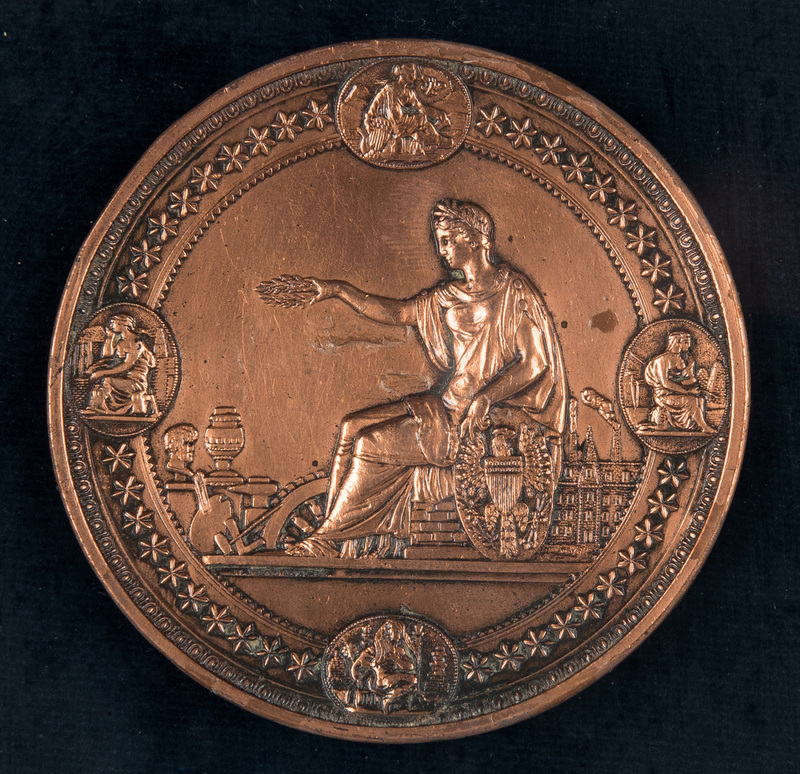 Marked J.B and A.S. Wyon; and one (1) medal depicting Classical figure on throne, possibly Britannia, extending a laurel wreath to a bust, palette, and other objects emblematic of the Arts. All mounted on black velvet and housed under glass in a giltwood frame. Medals approximately 3" dia. 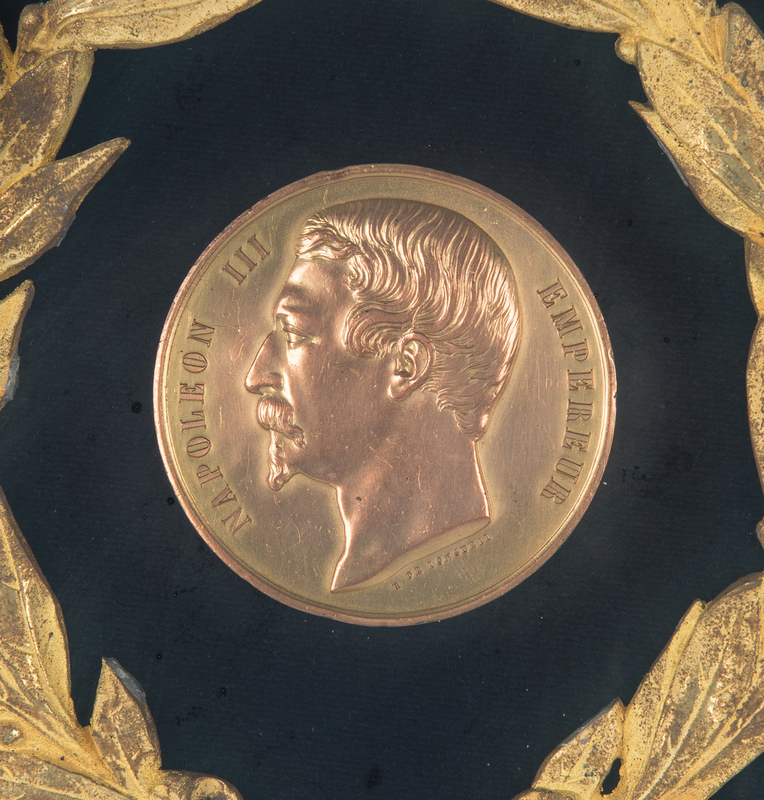 Framed – 18" H x 10" W. 2nd item: Framed Emperor Napoleon III medallion, likely bronze, by E. de Longueil. 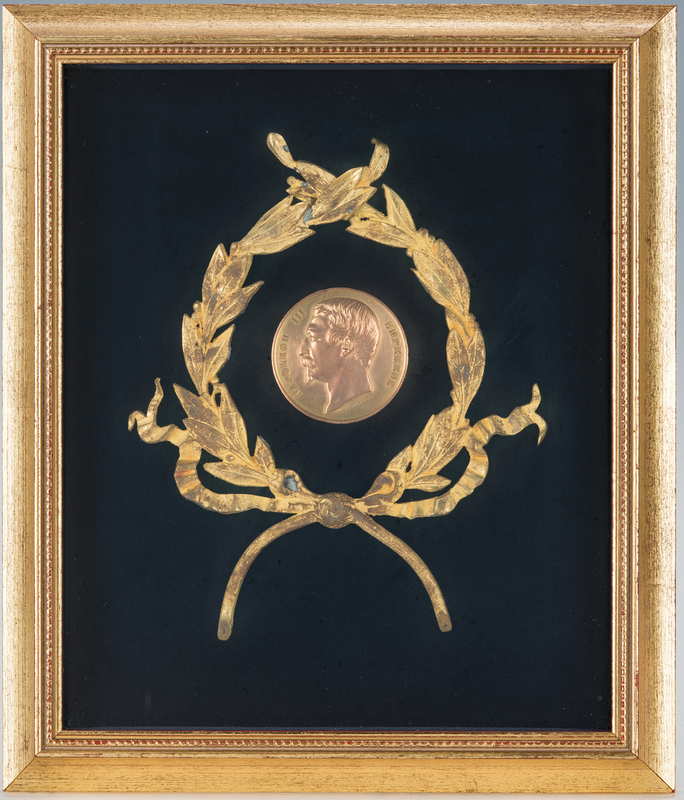 Surrounded by gilt metal laurel wreath, all mounted on black velvet and housed under glass in a giltwood frame. Medallion – 2 1/2" dia. Framed – 15 1/2" H x 13 1/2" W. All items European, mid/late 19th century. Provenance: collection of Johnny Maddox, Gallatin, TN. CONDITION: All with small scattered spots of pitting and light oxidation, a few scattered light scratches. 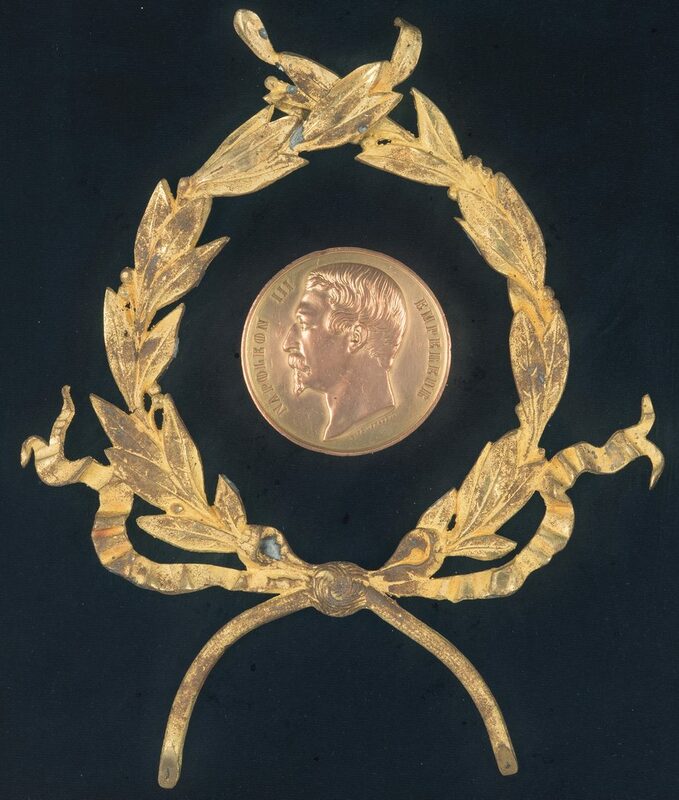 Scattered wear and oxidation to gilding on wreath surrounding the Napoleon medal. Not examined out of frame.